Smotrytsky, Meletii [Смотрицький, Мелетій; Smotryc’kyj, Meletij] (secular name: Maksym), b 1577 in Smotrych, Podilia (now in Dunaivtsi raion, Khmelnytskyi oblast), d 27 December 1633 at the Derman Monastery, Volhynia. Philologist, churchman, and polemicist; son of Herasym Smotrytsky. He studied at the Ostrih Academy; the Jesuit college in Vilnius; and, from 1605, in Leipzig, Nuremberg, and Wittenberg. In 1608, he returned to Vilnius to teach at the Orthodox brotherhood school. There he wrote (in Polish) his famous defense of the Orthodox church, Trenos, to iest lament iedyney ś. powszechnej apostolskiey wschodniey cerkwie (Threnos, or the Lament for the One Holy Universal Apostolic Eastern Church, 1610). He entered the Holy Spirit Monastery in Vilnius in 1617 and published a didactic gospel. 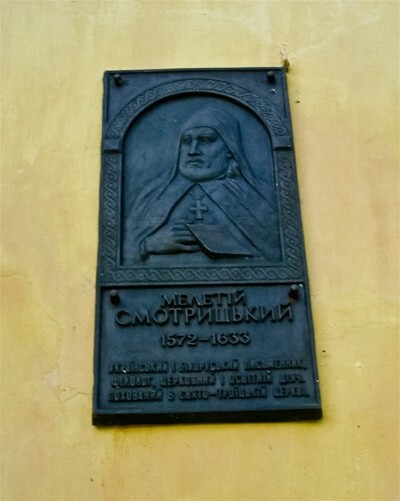 He is believed to have served as a professor and rector of the Kyiv Epiphany Brotherhood School in 1618–20. In 1620 he was consecrated archbishop of Polatsk by Patriarch Theophanes III of Jerusalem. During the next three years he wrote several polemical tracts (see Polemical literature), including Verificacia niewinności (A Verification by Innocence, 1620) and Oborona Verificaciey (A Defense of Verification, 1621), justifying the re-establishment of the Orthodox church hierarchy by Theophanes and defending the Orthodox against charges of collusion with the Moslems and Muscovites. 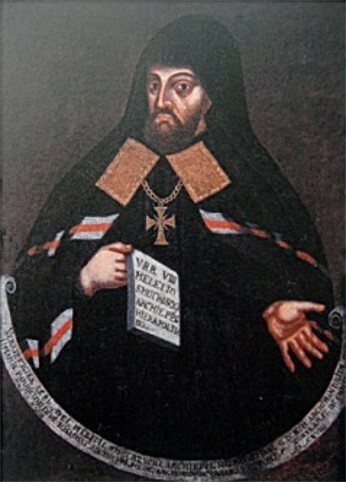 Smotrytsky traveled to Constantinople and the Holy Land, and after his return he joined the Uniate church, in 1627, and entered the Derman Monastery (some scholars believe he may have converted secretly earlier). 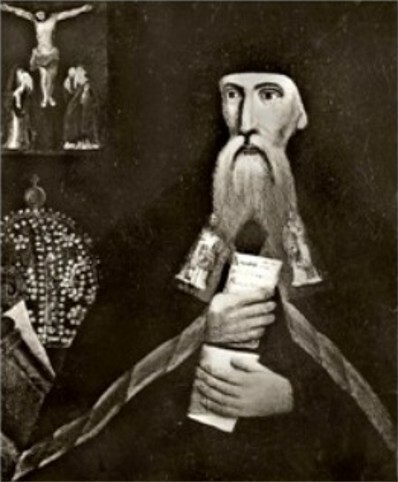 In 1627–8 he negotiated with Yov Boretsky and Petro Mohyla in an attempt to re-create a united Ruthenian church in union with Rome but under its own patriarch. In preparation for the discussions, he wrote Apologia peregrinatiey do kraiów wschodnych (Apology for the Peregrination to Eastern Lands, 1628). When the negotiations failed, Smotrytsky was condemned at the Orthodox church synod in Kyiv in 1628 and forced to recant his conversion to Catholicism. Subsequently he returned to the Derman Monastery. 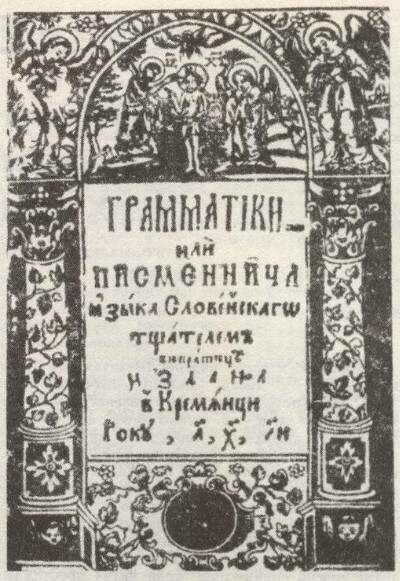 Smotrytsky's most significant contribution to philology was Gramatiki slavenskiia pravilnoe syntagma (The Correct Syntax of Slavonic Grammar, 1619; reprinted in 1974 with an introduction by Oleksa Horbach). 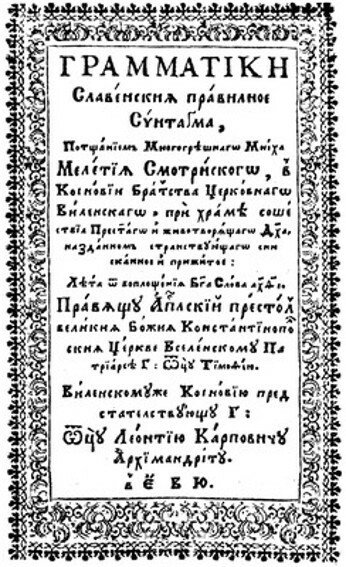 This work influenced the form of the Church Slavonic used in Ukraine, Russia, Romania, Serbia, and Croatia, and several subsequent editions were published. 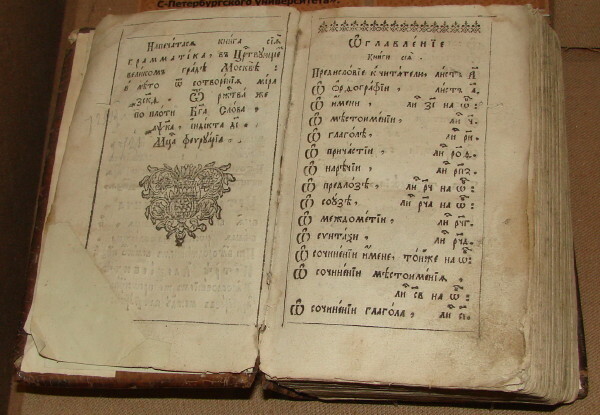 A shortened version, for use as a school textbook, appeared in Kremenets in 1638 (see Kremenets Grammar). Smotrytsky's grammar has been extensively studied by Ukrainian, Russian, and German linguists. Facsimile reprints of most of his collected works were published in 1987 in two volumes introduced and edited by David Frick. A referral to this page is found in 40 entries.